The ongoing internationalization of production has altered the economic landscape. Many products used to be produced locally using inputs drawn largely from the domestic economy, which implied that most of the value chains or production processes used to be located in the country where a firm had its headquarters. 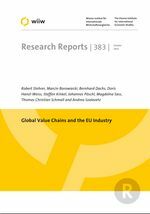 Technological development has facilitated the geographical fragmentation of production processes, resulting in the emergence of global value chains. Different parts of a firm’s production processes can now be located in different parts of the world, according to the comparative advantages of the locations. This ‘slicing up of the value chains’, and the dispersal of the various elements to different parts of the world has given rise to increased trade with the use of imported intermediate goods in manufacturing industries having been increased globally, thereby involving more industries and countries in the value chains. Focusing on four important manufacturing industries (chemicals, chemical products and man-made fibres; machinery and equipment; electrical and optical equipment; and transport equipment) the ongoing trends of the internationalization of production is studied. To account for the multi-faceted phenomenon of the internationalization of production processes and its consequences, a comprehensive review of the literature is provided first. This is followed by an overview of the patterns and trends in vertical specialization across countries for the four selected industries. This section is based on the World Input-Output Database (WIOD), which allows the integration of production patterns and processes to be studied at a global level. As this is accompanied by similar trends in trade before and over the crisis the next section focuses on the changes in trade patterns of these industries which is based on detailed Harmonized System (HS) 6-digit trade data allowing for a differentiation between use categories of products: trade in parts and components is important for the machinery and equipment, electrical and optical equipment and transport equipment industries, while trade in semi-finished products is important for the chemicals industry. As the offshoring decisions are made at company level it is important to understand the motives leading firms to offshore, the drivers of the decisions with respect to characteristics of the host and the destination country and the characteristics of the offshoring firms. Section 5 therefore focuses on the offshoring decisions at the company level: it analyses the motives and determinants of company strategies with respect to the relocation of production. Section 6 provides a summary.